I can’t sleep. I actually have the pre-race jitters, I’m that excited. A show of hands at breakfast reveals a table of seasoned bike testers all showing similar levels of stoke. Yamaha’s presentation of the technology on the new R1 made it quite clear that no holds have been barred, the pulling of punches has not occurred and metaphorical prisoners have not been taken. Claims like “This bike features technology that Valentino and Jorge don’t have” and “This is the closest possible thing to a road legal YZR-M1” hammered the point home. They wheeled out every R1 project leader since the original 1998 bike and even the President of Yamaha himself made time to head to Australia and introduce the new bike. It was explained to us that to make the new R1, the engineers started by looking at the YZR-M1 and seeing what it would take to make that road legal. No phony MotoGP DNA schpeil here. A thing of beauty. And lots of electronic cleverness. Saying that your bike is going to beat everything else out there is a seriously bold move when you consider the machinery that Ducati and BMW have just released. It’s important at this stage not to get suckered into the trap of playing spec sheet top trumps and letting that decide which bike is the best – there’s so much more to it than that. Power and weight are key factors, but with everyone claiming similar figures, what will be more important is how easy that power is to use. And with such a vast array of electronic assistance available, it’s easy to forget how crucial a good chassis is – all the traction control and electronic suspension in the world won’t be any use if you can’t get the thing to an apex. And the electronics themselves – just having traction control, for instance, isn’t enough. The difference between a good TC system and a great one is enormous and will decide whether you use it to get faster or switch it off in a sulk after one session. Having said that, the Yamaha does sport some never-before seen technology that is worth mentioning. LIF – Lift control – not anti-wheelie as such, but a system designed to reduce the violence with which the front wheel lifts to keep you driving forward as hard as possible. SCS – Slide Control System – not to be confused with traction control, slide control actually looks at how far the rear wheel has stepped out and limits that, which is more important in the first part of the corner exit. TCS – Traction Control System – we know this one by now, but this one works with the SCS to give the best possible drive off a turn. UBS – Unified Braking System – linked brakes to you and I, but not some crude linear set up, this is a fully variable system that changes the balance between front and rear brake based on how hard you are braking and how far you are leant over. ERS – Electronic Racing Suspension (R1M only) – developed in conjunction with Öhlins; the semi-active suspension talks to the IMU and adjusts according to acceleration and lean angle. IMU – Inertial Measurement Unit – this clever wee box measures lateral acceleration in three axes and angular acceleration in three axes. Got that? Basically it reads how hard the bike is accelerating forward/backwards, up/down and side to side as well as seeing how fast it’s leaning, turning and pitching. Thankfully, the R1 is not just a rolling showcase of fancypants electronics – some good old-fashioned engineering has been involved in trimming out weight and jamming in more power. We’ll start with the chassis – magnesium wheels were the first hurdle, providing a 870g weight reduction. But to make sure they don’t dissolve at the first sign of a British winter, Yamaha used an electrostatic coating technique to meet their quality standards. Clever use of materials throughout has helped drop the weight of the R1 to a claimed 199kg ready to ride. The subframe is Magnesium, the exhaust is Titanium, the Aluminium tank is 1.7kg lighter and plastic components like the rear mudguard and subframe cross members use carbon fibre reinforcement. As the headlights hint, only the slightest nod has been given towards road legalities, with all the road kit easily removed for track use. Further weight reductions come from inside the engine, with Titanium conrods, a shorter crank and detail changes like lighter pistons and lighter gears chomping out yet more weight. The engine even uses high-grade aluminium bolts to shave a further 250 grams. The clutch cover, for example, is held on with special one-use bolts that come in the kit when you buy a new gasket. They really have thrown everything they can at this. Oh and those Titanium conrods? They’re the first fracture split (made in one piece and then effectively snapped across the joining face) Titanium rods in a production bike and also the lightest ever fitted to a 4-cylinder production bike. Headlights, numberplate and mirrors are junked in seconds for full race spec setup. The engine uses rocker arms to activate the valves and DLC coating to help achieve the 1,000rpm increase in rev limit. The cylinder heads are now more intricately machined and, along with all the titanium and fancy components, Yamaha is claiming an 18bhp increase in power. The proof will, of course, be in a four-way dyno test with the other big hitters but for now the R1 is looking like it’s back in the fight. 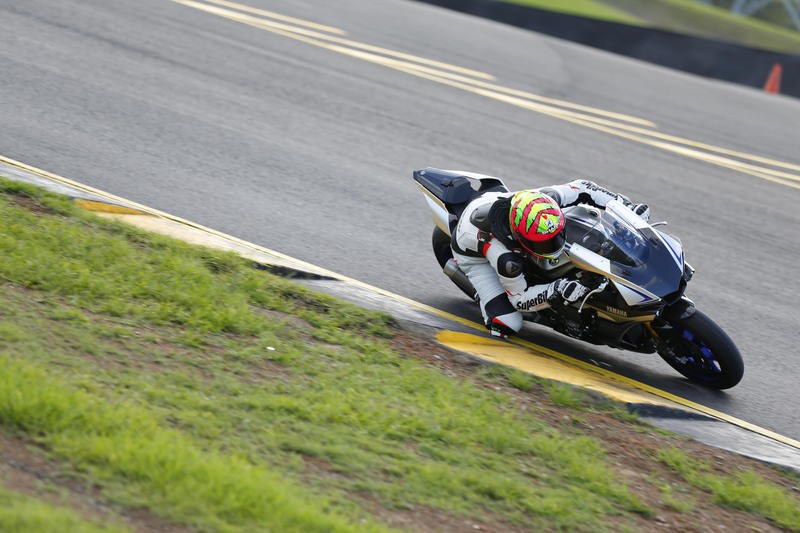 The first few attempts at sending it on the new R1 around Sydney Motorsport Park were plagued by the sort of weather normally found at an April BSB meeting. In such tricky conditions, it was hard to say too much about the R1’s outright performance, but the smile on my face spoke volumes about how easy it is to ride. The first prototype Yamaha built was the R1 engine in an R6 chassis and the finished article feels just like that. The front end is slim and compact, making you feel instantly in charge – there’s no intimidation at all. The engine backs that up, with a smooth response and easy, usable power at smaller throttle openings. 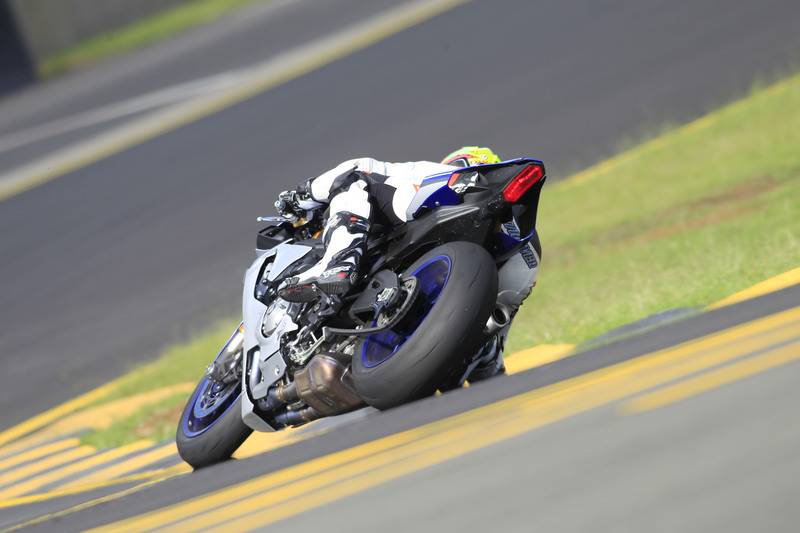 Tiptoeing around a damp track on Bridgestone’s RS10 supersport tyres, there was enough feedback to be happy to push on. And when the tyres did start to move, there was plenty of warning and no drama. Stretching a hopeful knee out, feeling carefully for any signs of movement at the tyre, and trying to ignore the rain on my visor, the R1 couldn’t be more supportive. All headline power figures and lap times aside, the R1 has already scored a big win in my book, excelling at making the most of mediocre conditions. Eventually the rain pissed off back to the Northern hemisphere and the R1 got its chance to really impress. Turn one is a big fast ball-buster of a corner, a long, fourth gear, varying surface monster that takes commitment to get the best out of. In the first dry session, I’m daring myself to brake later and later, taking liberties over the bumps and hammering the throttle on the way out. Another fourth gear slide paints itself over the Aussie tarmac and an even bigger grin paints across my face. This is the sort of riding typical of the last day of testing on a track and bike I know like the back of my hand. Not the first proper go on a new track and new bike. The R1 really does inspire you to push, in the way a 600 or 750 does. You’re not fighting to stop it all the time, it just seems to want you to run in fast, tap open the gas and destroy Bridgestone. One downhill right-hander at Eastern Creek has you leant hard on the edge of the front tyre for what feels like an eternity. The need to get a good exit has you pushing hard to get back to the apex and every time the R1 obliges. You can feel exactly what the front tyre is up to, no holding your breath, no squinting just lots of feedback and even more lean. It. Is. Sublime. Oh, there we go, it’s sliding a bit more now. Hey ho, I’ll just carry on regardless. That’s the confidence you get out of the 90% in house developed electronics package. The ability to note a little more movement in the tyres and carry on pushing exactly as you had been, using the TC and SCS to mop up the difference in grip. With both backed off to their lowest setting and a really worn tyre, you could find the balance between sliding loads and leaning on the electronics, or feeling for grip and trying to keep the bike driving forward. Or you could just dial in more intervention and carry on blissfully unaware of how much work the bike is doing for you. 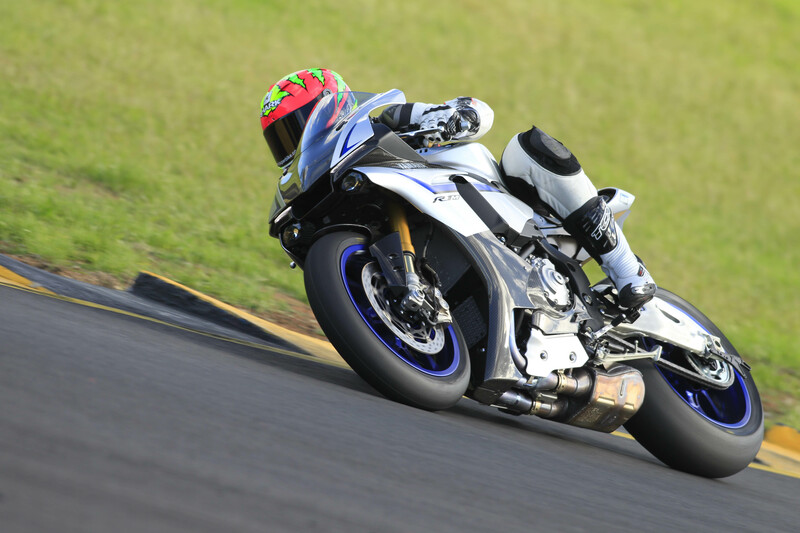 As the last ounces of grip were scrubbed off the rear tyres on the R1, we were handed the keys to a fresh fleet of R1Ms on tasty new Bridgestone slicks. Don’t mind if I do. Because the R1M is designed soley to be the fastest road legal bike around a track, Öhlins were given free reign to make their electronic racing suspension system deliver the lap times. And deliver it does; with stiffer springs you get the support you need to get the most out of the slicks. The active damping works unnoticeably in the background keeping things in check however hard you push. Where the standard bike could be made to pump and move when hard on the gas over bumps, the M just hooks up and drives forward. No drama, no fuss, just speed. 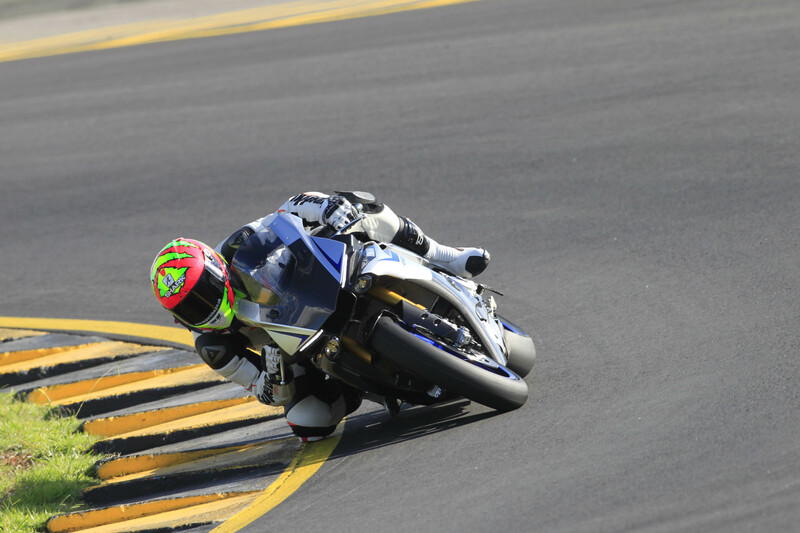 The R1 smashing another apex. It’s really good at this. 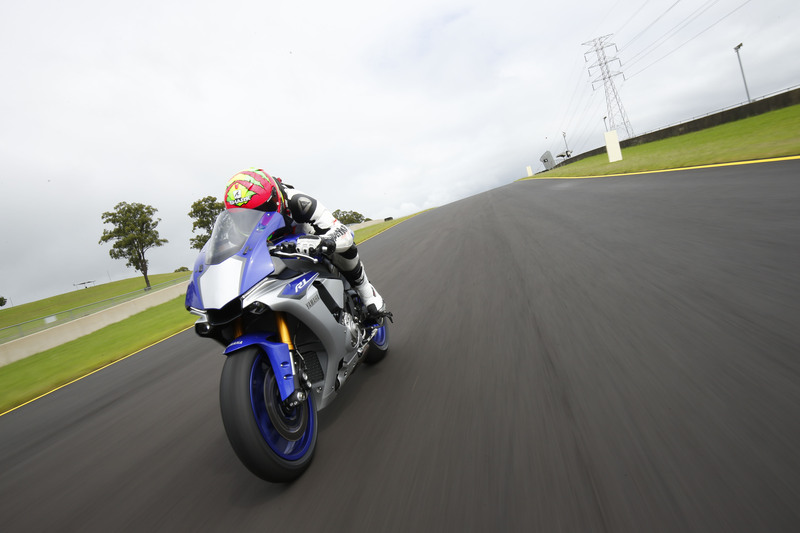 In isolation, the new 2015 Yamaha YZF-R1 is an absolutely sublime piece of kit. It makes pushing yourself to go faster on track as easy as possible for a 1000cc bike, regardless of your skill level. The faster you go, the more it seems to work with you, railing into turns like a 600cc supersport bike, and letting you get on the gas appallingly early on the way out. The base model does start to move around a bit when you really, really push it, but that’s where the M version offers you the extra capacity to go faster. Realistically though, this bike has to stand up next to some pretty accomplished competition. I was surprised not to see any adjustable engine braking control, such as the BMW and Ducati have, but the slipper clutch does work really well on the R1. Likewise, it is a shame that it misses out on the clutch-less downshifting system too. But in terms of chassis performance and the traction/slide control systems, the R1 definitely has the upper hand. It’s much less aggressive to ride than the other two, working with you and never feeling like it wants a fight. Only a three-way shoot out will tell the truth, but for now the R1 is certainly back in the game. What a bike. 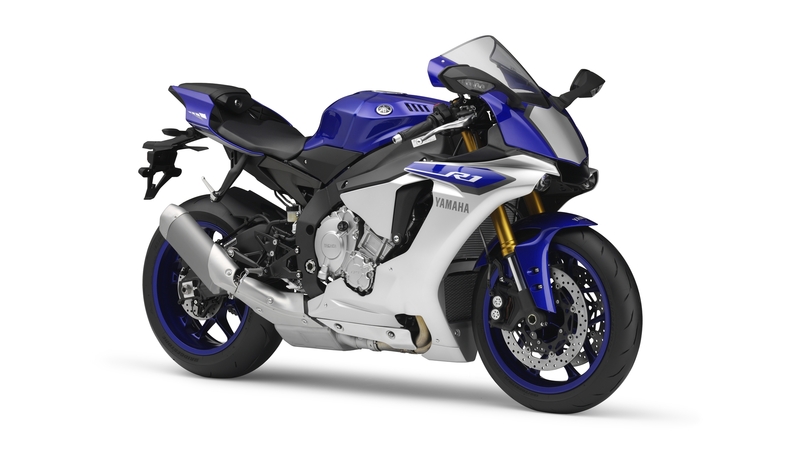 Yamaha’s R1M – the same as an R1 but more awesome. The standard R1 costs £14999, the R1M costs £18499. The base model weighs 199 kilos ready to ride, the R1M weighs 200 kilos in the same trim. Both models make 197.2bhp at the crank, without any ram air effect. You can expect a couple of follow on features about this new bike over the next few weeks, or you can click here and buy one right now.